Reenergize your home with a healthy dose of natural sunlight, added living space, and beautiful views. An elegant sunroom merges indoor comforts and outdoor splendor to create a versatile entertainment area with year-round benefits. 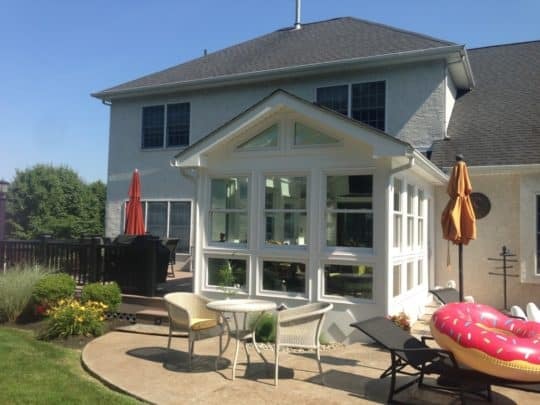 The crew at Paul Construction and Awning will make sure you never regret adding a sunroom to your home. Our master carpenters and construction specialists have decades of experience designing and building stunning additions. From consultation to completed build, you can rest assured our team will respect your privacy and your home. Call 610-287-1623 today to get a quote. Living space is in short supply. But relief from your cramped conditions doesn’t have to mean ditching the city limits and moving to the countryside. Not only is adding a sunroom living room a cost-effective way to extend your indoor square-footage, but this glassed-in space will also flood your home with natural light. At Paul Construction and Awning, our contractors will visit your home, evaluate your property, discuss your ideas, and provide recommendations on how to implement and enhance your vision in the final design. Afterward, we will provide you with hand-drawn sketches of our future plans for your space. Not happy? No problem: Our team is ready and willing to make changes based on your feedback. We are committed to providing a comfortable and responsive customer experience. We will aim to create a sunroom that will beat your highest standards. At Paul Construction and Awning, we use only the highest quality of materials installed under the strictest scrutiny to ensure every element of your new sunroom is built to stand the test of time. Besides creating sunrooms, we also design and build post and beam additions, custom decks, patios, gazebos, trellises, outdoor kitchens and living areas, and more. Think of us as your one-stop shop for all your indoor and outdoor construction needs. Our team is ready and waiting to add a modern, stylish sunroom to your home. Call 610-287-1623 to reap the rewards of this cost-effective addition today with help from the crew at Paul Construction.